Iraq has no Weapons of Mass Destruction. What’s next, now? Mahmoud Ahmadinejad, who was elected Iran's president in June 2005, was an obscure figure when he was appointed mayor of Tehran in the spring of 2003. He was not much better known when he entered the presidential election campaign, although he had already made his mark as Tehran mayor for rolling back reforms. Since his election he has taken a tough stand on a number of foreign policy matters, in line with his hardline background. Mr Ahmadinejad was born in Garmsar, near Tehran, in 1956, the son of a blacksmith, and holds a PhD in traffic and transport from Tehran's University of Science and Technology, where he was a lecturer. There has been confusion about his role in the 1979 Islamic Revolution. Several of the 52 Americans who were held hostage in the US embassy in the months after the revolution say they are certain Mr Ahmadinejad was among those who captured them. He insists he was not there, and several known hostage-takers - now his strong political opponents - deny he was with them. His website says he joined the Revolutionary Guards voluntarily after the revolution, and he is also reported to have served in covert operations during the 1980-88 Iran-Iraq war. When he became mayor of Tehran, the former revolutionary guard curtailed many of the reforms put in place by the moderates who had run the city before him. Iran's outgoing reformist president, Mohammad Khatami, barred Mr Ahmadinejad from attending cabinet meetings, a privilege normally accorded to mayors of the capital. The mayor shut down fast-food restaurants and required male city employees to have beards and long sleeves. And he took down an advertising campaign showing UK footballer David Beckham - the first Western celebrity used to promote a product in the country since the revolution. He reportedly spent no money on his presidential campaign - but he was backed by powerful conservatives who used their network of mosques to mobilise support for him. He also had the support of a group of younger, second-generation revolutionaries known as the Abadgaran, or Developers, who are strong in the Iranian parliament, the Majlis. His presidential campaign focused on poverty, social justice and the distribution of wealth inside Iran. During his campaign, he also repeatedly defended his country's nuclear programme, which has worried the US and European Union. Once in power, he made a defiant speech at the UN on the nuclear issue and refused to back down on Tehran's decision to resume uranium conversion. Nuclear negotiations with the EU are now stalled. Mr Ahmadinejad also drew widespread criticism from the West when he told a conference in Tehran that the state of Israel should be "wiped off the map". He has been cautious about re-establishing formal ties with the US, which were broken in 1979. "America was free to sever its ties with Iran, but it remains Iran's decision to re-establish relations with America." 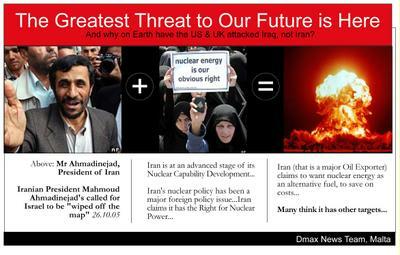 At home in Iran, Mr Ahmadinejad has a populist streak, calling his personal website Mardomyar, or the People's Friend. He also has a reputation for living a simple life and campaigned against corruption.